Three weeks ago, I bought my annual batch of tomatoes to preserve. 100 pounds worth. I canned them whole, I canned them crushed, I slow roasted and froze them and I made 17 pints of corn and tomato salsa (keep your eyes peeled for a comprehensive tomato preservation post coming soon). And still, there were tomatoes. So I tackled a project that had always intrigued me. I made tomato paste. I chopped, simmered, milled, simmered, pureed, reduced and canned 12 quarter pint jars of tomato paste. I followed the recipe on the National Center for Home Food Preservation website nearly to the letter. The only omission I made was to skip the garlic clove. I’ve been so conditioned to avoid adding low acid foods to tomatoes that it just didn’t seem right, particularly since this recipe is not acidified (from what I understand, when you cook down the tomatoes to this extreme, you concentrate the existing acid to such a degree that it’s not necessary to add any more). I started with approximately 16 pounds of chopped tomatoes at 3 pm on a Saturday afternoon. After an hour of simmering with three cubed red peppers, a bay leaf and a generous pinch of salt, I ran them through my food mill (a brand new purchase, made by Kutchenprofi. The little legs snapped off the minute I started to use it, making it necessary to hold the mill in the air while pressing the tomatoes through. It was frustrating). 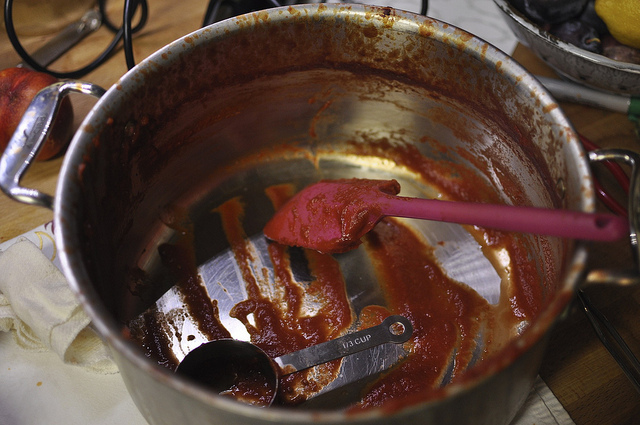 Even after six hours of cooking, I think my tomato paste might have been able to reduce further. However, I was out of patience and ready for bed so it went into the jars. The NCHFP recommends using half pints to can tomato paste, but I opted for quarter pints because I rarely use more than a tablespoon or two when cooking. However, as is best practice, I did not reduce the processing time for my smaller jars. They still spent the full 45 minutes in the canner. Canning can be a lot of work. I am aware of this and happily do that work when I take on a new project, knowing that nearly all of the time, my end result will be so much better and more satisfying than anything I could buy at the store. However, after tasting my tomato paste, I was disappointed. My paste, which was made from perfectly delightful plum tomatoes, tasted bitter and flat. For the first time in my canning life, I had to confront the truth that the store bought version was better than what I had made. What’s more, while my tomatoes were fairly inexpensive (I paid $40 for 100 pounds this year), this batch of 3 pints of tomato paste still cost approximately $7 in raw materials and 10 hours of time (that doesn’t include the cost of the jars that the paste is currently occupying). I’m not sure if the investment works out this time around. I am not suggesting that you guys shouldn’t make tomato paste. I’m sure the fact that my preparations went later than expected and that my food mill started falling to pieces didn’t help me to feel happy and rosy about this recipe. But I think next year, I’ll stick to tomato preservation projects that offer more return on investment (like crushed tomatoes) in less time. This one just didn’t float my boat. I SO appreciate the fact that you share the ones that don’t go well, not just the ones that look and taste fantastic. I’d been wondering about tomato paste and this tells me I’m better off putting the effort into my homemade ketchup, which my family loved, if I’m going to spend all day chopping things and reducing and smooshing and waiting. Love your blog. Great photos too. to make our paste, we simply blend the tomatoes with skins and seeds still intact to make a puree, we then simmer it down until it is the thickness of paste we want using a heavy bottomed kettle. By leaving the skins on it is a much more nurtitious product. 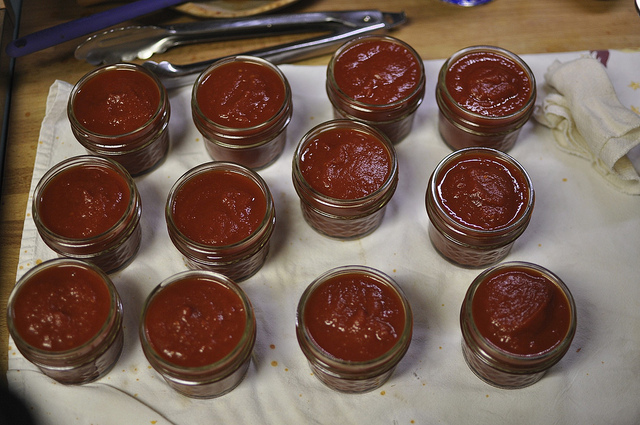 We do this method for all our tom sauce canning. Wow – thanks for the honesty in your post – when I first saw this, I was really excited, but you know, it’s kind of nice to know there are some things you don’t need to can/process on your own? Love it! I’ve tried this before and it always ends up with a strong bitter tomato paste. I’ve often wondered if cooking them down in a non metal utensil would make a change in taste. In the end, you know just what went into the jar. I’m going to ‘ditto’ what others have already said. It’s almost a relief to know there’s something I don’t need to worry about making…thanks for the post! Sorry it didn’t turn out as well as you wanted. I’ve found that even the disappointing projects are rewarding just because they were homemade. Where did you find 100 pounds of tomatoes to buy for such a great price??? I can’t imagine how exciting that would be to have so much to preserve! I’m happy when I have ten pounds from my garden! I love that you posted this. I attempted the same recipe yesterday with even worse results. I spent what seemed like a million years creating what turned out to be bland paste. And to boot, the yeild was much less than expected. Today I made a bunch of salsa which proved to be a much better use of my never-ending bushel of tomatoes. Often thought of making paste but switched to making Ketchup instead . It also is awhile to cook down ;now use slow cooker it is truly easier then. Doesn’t store bought have a lot of sugar and salt in it? So yours is a base tomato paste that would enjoy a full body red wine and some chummy roasted garlic company when it goes to the ball (recipe of your choice goes here). Oh, don’t you just hate that? 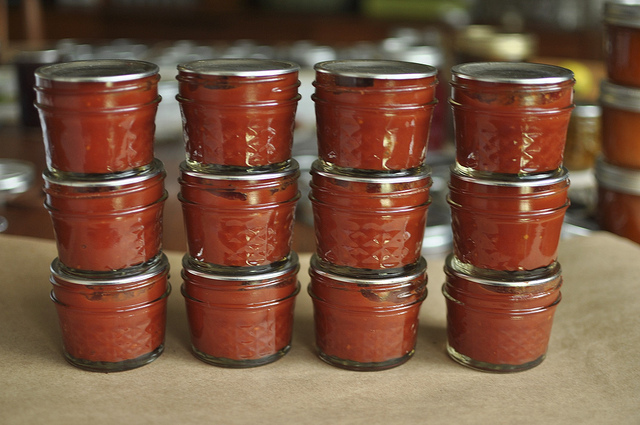 It’s strange: I made tomato paste in my first year of canning, 2008, when we had a banner tomato year in the Northeast. Maybe it was just my fledging appreciation of eating locally, but I still remember that tomato paste: I called it “liquid gold.” Then we had tomato blight (2009). Then last year, I made tomato paste again: this time, I was crazy busy, so I drained the tomato juice away in a jelly bag and cooked the resulting pulp to make tomato paste. Only about 30 minutes of cooking, but it definitely did not have the same amazing flavor. I haven’t made it this year (I still have half a dozen 1/4 pints, so that’ll hold me for a bit) but I think I’ll be searching for the elusive “liquid gold” for a while yet. And – my recipe was from the Ball Book and did require acidification. But we all know tha tthe Ball is super-conservative: good to know that NCFHP doesn’t require it. When I do my tomato paste I add a bit of sugar, I know it may not be the thing to do, but I think it brings out the flavour. I also reduce the paste in my crockpot on low with the lid ajar. I don’t bottle, I freeze, so I am not so concerned with the keeping quality. Enjoy following your adventures in the kitchen. Gives me ideas for my coming season -being as I am, on the other side of the world. That’s the cure (sugat) I’ve always heard for bitter tomato products, but I find that sometimes even the commercial ones with lots of sugar and salt tend to be a bit bitter. Sorry, Marisa, that it didn’t go well – that’s an exceptionally large amount of work on that one to be disappointing. Thank you for recording it, too. This right here is what I love about the internet that you can’t get from other media. I am looking forward to the corn and tomato salsa post, too. Using the slow cooker is a fabulous idea! I’m debating dehydrating some tomatoes until they are crisp this year and grinding them into powder to use as tomato paste. It all really depends on how many more tomatoes I get out of my garden. I used a tomato strainer to do sauce on the weekend and then dehydrated the remaining skins and seeds. I put the dry skins and seeds through the food processor to powderize them and I’ll use that as ‘paste’ throughout the year. I absolutely agree!!! we did some tomato sauce, because hubby wanted to. It is too putsy I hated doing it!!! we have 9 pints, that’s enough….we will be canning the rest of the tomatoes!!!! I was so excited to see this post, as I’ve wanted to make this. Having said that, I’m so glad that you posted this, and that I don’t have to waste my time. Thank you so much for all the information you share! Yeah, it’s hard to beat the convenience and taste of the commercially prepared pastes. Sorry it didn’t work out better. I’m so glad you posted this. I’ve been flirting with the idea for some time now and have never given it the time and energy. It’s nice to get the feedback. Thanks again. Oh Marisa, so sorry that after all the time and effort this one wasn’t worth it. Funny how some of the home-canned things (most) turn out absolutely fantastic, but sometimes you try one that’s just a “meh.” I did garlic paste last year with our homegrown garlic, and it was super disappointing. My latest tomato success is the tomato juice I’ve been making and freezing in quart jars. Not a lot of hands-on time, and the results are vunderbar. Keep up the great posts; you are so helpful to the rest of us. I love this post, Marisa. You may end with the conclusion that home-canned tomato paste isn’t worth the effort, but all along the way you provided great information about working with tomatoes. And it delights me that so many of the comments are from folks who are relieved that now they don’t have to do it themselves, either; it sounds like you saved some time for a great many readers! I don’t use tomato paste often enough to consider making it myself, but I am ramping up my other tomato canning projects, so I look forward to your tomato roundup. Ah Marisa! What a bummer! I hate it when projects that are long don’t end up seeming worth it. Grr! I’ve wondered about making paste too but always shy away from anything that seems tedious. I imagine that it will still perk up some winter recipes though? I never think tomato paste tastes all that great by itself anyhow right? Hi Marisa – what a pity this recipe didn’t come up to scratch. Given that you are so experienced in canning, I’m loathe to tell you something you already know! But – seeds make for bitter tomato product and sugar should always be added to tomatoes. It’s just something magic that seems to work in bringing out the best in tomatoes. Don’t give up! Give it another try next year, when your angst and disappointment are just a distant memory. Oh dear, how tiresome to have spent so much time on a disappointing project. It’s nice to hear that even the experts have moments of tedium. My dad once gave a tip for tomato paste, since, as you mentioned, you only ever use a Tbs or so at a time. Whether he’s made homemade paste or storebought, he makes tiny one Tbs cellophane twists of the remnants to tuck into the freezer. They’re so little, they take up no room at all. And they’ve saved my bacon on more than one Thanksgiving with the mushroom gravy (I never remember to buy paste).! Sorry it didn’t work out. We had pizza sauce like that one year. Question: Instead of staying up to process in the middle of the night, could you have popped it into a crock pot to simmer or “keep warm”? I made chili sauce this year for the first time and put everything in the crock pot to cook. I turned it on a 11pm on low knowing I wouldn’t get to it until 7am at the earliest. When I did get to it, I put it into a pot on the stove to cook down which only took an additional 30 minutes. Not that it would’ve changed the bitterness in the taste but it might have eased a bit of the bitterness from all the effort? Nothing is more frustrating than not being satisfied with the end product after so much time and effort. I am back to canning after some years of being too busy and my first batch of bread and butter pickles turned out too spicy (cut back on the tumeric and cloves in 2nd batch) and I sliced them too thin using a fancy mandolin (back to just using a good knife like my mom always did). I was making them when we had the earthquake, out on my deck on a propane burner (that was something!!). As for tomato paste, its more of a thickener so it may still work out ok for your recipes. Thanks for posting this…it’s nice to know I’m not the only one with disappointing yields. You’ve inspired me to get back into my “kitchen therapy”. I hear you on the watching and waiting–I can a lot of thick tomato puree every year. Every year I remind myself that I should only do it in small batches (20 quarts of tomatoes take a hell of a lot longer to reduce down than 5 quarts), and every year I forget! And thanks for the tip on the food mill. I have an old Foley one and it rusts every time I wash it, and so I think I want to buy a new one. I’ll stay away from that one with the busted legs! So sorry the paste didn’t turn out right. So happy to see an honest canner showing not only her successes but her flops. Love your blog! If you attempt it again, add some sugar to bring out the flavor of the tomato and add some lemon juice to compensate for the acidity. Thanks for the sharing this post. I too had been considering making tomato paste and after your post, thought better of it. I LOVE canning, but it IS time intensive and at the end a canning day my feet and back always ache. Last year I made pints and pints of pickled green beans only to have them so sour you could barely eat them and I still have jars and jars of them on the shelf. All that work and time to not be able to enjoy them~ such a disappointment!! But the love of canning and trying new recipes will keep us pressing on!! Can’t wait for your full tomato canning post! As Paul Bertolli says, “Cooking by hand is trouble. But experience has show that the trouble will become your enduring pleasure. A way to spend hours cooking something you can buy in the store? I am so there. Conserva, essentially tomato paste, tomato reduced to its purest, richest form. Bertolli has you reduce the tomato in the oven over hours, roasting rather than simmering which perhaps imbues the tomato with a rich roasted flavor you don’t get on the stovetop or in the crock pot. Believe me, it is more than a days project and you end up with about a tenth of what you started but like Kaela said you end up with “liquid gold” that is exactly what I called my four or so tablespoons. I agree those who suggest a little sugar to temper the bitter. I am sorry you were disappointed, nothing worse after a big project that takes hours! I made tomato paste last year, oven roasted. Yes it took all day for it to thicken, but it turned out lovely. I think I followed a recipe from Mrs. Wheelbarrow. I also froze it in small containers rather than processing it. Good to know! I have heard similar echoing’s about making tomato paste on other blogs too and I have decided, this is one thing I will skip! I started making tomato paste two weeks ago. At one point in the process it was a delicious marinara, so I canned it. Last week I made a paste by peeling and seeding plum tomatoes, pureeing them and baking the puree in the oven at 300 for four hours. I found that turning the mixture and spreading it back out over the sheet every hour gave the end product a great depth of flavor, neither bitter nor burned. It was wonderful! I did not go the extra step and hot bath them, as I would prefer to cut a chunk out from the jar in the freezer when needed. I was okay with the minimal return only because I prepared myself, avoiding too much disappointment in the end. It is such a let down when what you envision and the time you spend do not pay off! I was just thinking last night as I was making my second and third batches of tomato jam (thank you SO much for that recipe, I don’t know how I ever lived without tomato jam) that I should try tomato paste to go along with the 80 quarts of crushed tomatoes and sauce that we put up this year. Glad to know that I shouldn’t waste my time with that project. Thanks as always for the excellent advice. And by the way, I LOVE your turquoise stove. I’ve read about making tomato paste in a food dehydrator (assuming you have plenty of those fruit leather inserts). This was my experience with homemade ketchup 30 years ago. It tasted good, but was soo not worth the effort! so happy to find your blog, and hope to take a class next summer since i’m close enough here in the lehigh valley. i did make tomato past last year, and i also give my vote to roasting the tomatoes. and though i’m sorry to hear about your less than satisfactory results, a newbie like me appreciates the honesty and authenticity! i often think of trying to make tomato paste at home. i trust your experience marisa – canning may not be the right technique for this product. that’s what so great about preserving, there are so many methods and not all are right for everything. I’m sorry you weren’t happy with your finished product after so much work. Homemade tomato paste IS time consuming and expensive compared to .36 cents a can at the grocery store. HOWEVER, for two years in a row now I have been delighted with my homemade tomat0 paste – it’s like gold! The concentrated, deep, rich tomato flavor is exquisite. Since it is my own product in glass jars, I know exactly what is in it and don’t need to be concerned about BPH leaching from a high acid product in cans. Every winter as I cook Turkey Chili or some wonderful Italian concoction the paste makes me smile. SO worth it. If you’ve thought of trying this, don’t be discouraged. Just be prepared for an entire day of work. :o) Put on an apron, a book on tape or CD and go to town. i made tomato paste a week or so ago following Saveur’s recipe (http://www.saveur.com/article/Recipes/Homemade-Tomato-Paste) which involves cooking and roasting. i didn’t can it and i’m just keeping it in a pint jar in the fridge. i think that mine is really, really good – better than the store bought version hands down when it comes to taste. but you’re right – the time and energy and cost break down – i don’t know if it’s something i’ll start doing on a regular basis. I stumbled across a great way to make tomato paste… low fuss, low muss, and generally easy-peasy! 🙂 Use a non-stick roasting pan in the oven! I have a huge non-stick roasting pan (my Thanksgiving turkey roaster will fit a 25+ lb bird with room to spare) and the garden has been going absolutely bonkers with tomatoes. 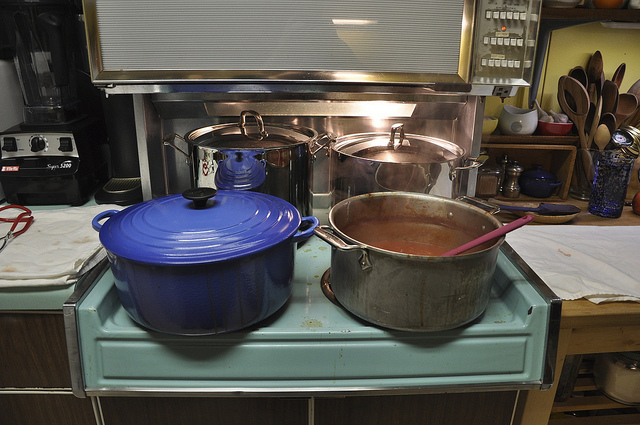 I decided that I was going to try doing my tomato sauce in the oven, since I had more than would fit in my 21-quart graniteware pot and I wanted to be able to cook something for dinner on the stove-top (which had, at that point, been used exclusively for canning for 4 days straight). I halved, cooked and milled on day 1. Then I put it in the oven at 250F overnight. When I checked it the next morning, it was reduced down to paste that has this amazingly intense tomato flavor. Since this was just a happy accident, I chose to freeze it instead of canning it, but I did make a note in my canning notebook that when I decide to actually attempt tomato paste, doing it in the oven makes it so much easier! I can tell you also that using metallic pots can give an undesirable flavor to tomato products- it’s very wise to use a ‘coated’ pot (enameled, graniteware, non-stick or whatever), particularly for stuff that requires a longer cooking time. The longer the cooking time, the more one risks the tomato acid reacting with the metal. And my Grammy would tell you to make sure you use more than 1 kind of tomato (and seriously, that woman’s word was gospel truth when it came to canning!). As near as I can figure, the different varieties being all mixed together give it a depth of flavor that you just can’t achieve when you’re using only 1 type- each variety brings its own distinct flavor characteristics to the party. @Daedre- I **really** do NOT recommend attempting the dehydrator tomato paste. I speak from experience here. Each tray might yeild a tablespoon or 2 of paste, and if you don’t have it exactly right, time- & temperature-wise, good luck getting the tomato cement off of the trays! Plus it leaves that lovely stain that tomato leaves on all plastic… yeah, I definitely don’t recommend it, LOL. Bummer about your food mill! The one I use is a hand-me-down from my mom (who inherited from her grandmother I think), and it is very sturdy. I guess they just don’t make them like they used to! My Italian mother and her five siblings were compulsorily involved in processing ridiculously huge quantities of tomatoes to keep the family going through the winter (The raw product was u-picked from a local farmer. Their parents went to work and the CCC to pull through the depression. Thrift runs deep). They made mostly whole tomatoes, but some were diced or stewed, as they were combined later into essential pasta sauce. The only other essential ingredients in the “secret family recipe” are paste and three types of meat to flavor the pot, usually a beef and two pork products. When I asked if they made the paste too (which seemed logical) my mom always responded with an emphatic “no” that it was not worth the effort, time, money. But it was clear she had never tried it. So I always wondered. I’m sorry you proved that point 🙁 I wish you much happier canning soon! And a sturdier food mill. mine was also bitter- I haven’t processed it yet, so I’m going to add a smidge of sugar and lemon juice and see if that doesn’t help. I found a post on doris and jilly (http://dorisandjillycook.com/2009/09/02/canning-roasted-tomatoes/) about putting up roasted tomatoes. I did 6 pints last night (2 turkey roasting pans) and still have a few dozen tomatoes to do something with. Soup and freeze, I think. ok, so I finally processed them- but I added some non-olive oil roasted tomatoes, some lemon juice (about 1/4 cup), 2T sugar and 2 t salt. It really made a difference. I put up 10 quarter pints and still have a ton left, so it’s going to become bbq sauce. Good reading here, Marisa! The comments and your post. Sorry the tomato paste didn’t turn out. Have you tried ketchup? Similar process with more spicing and I find it’s fabulous, much better than storebought. One trick I learned, though, was to cut the receipe in half – I now use 12 lbs tomatoes at a time, rather than 24 lbs. When I tried a full batch with 24 lbs, the cooking time was so long that the product turned dark and somewhat bitter. I wonder if you could get better tomato paste results by cutting your recipe in half and cooking much less – my half-batch ketchup now stays bright and sweet. Good luck! Great post. It’s great to know your thoughts. I’m sure you know this, and I can’t tell if you removed the seeds or not, but supposedly the seeds cause bitterness, but then supposedly not if they are cooked long enough–and you certainly cooked them long enough to get rid of any seed-bitterness. Also annoying about your food mill. Those things drive me nuts! 2) in a deep pot & in small batches, fry the tomatoes fiercely for 10minutes & pass them through a sieve. You will need the olive oil to be at least 5mm deep at the bottom of your pan & really hot (without smoking.) then put in your toms ( I always use a splatter guard. The toms will start to break down at 8-10 mins, then you can put them through a sieve. You can use a food mill, but be really careful not to push through or crush the seeds. I actually bought a special machine in Italy that carefully separates out the seeds & skin. Then reduce slowly on a stove. I would also add sugar & salt to improve the flavour. I hope it goes well next time. I loved your photos and story. I really enjoy Food In Jars I have you listed under Favorite Blogs on my website and would love to have you stop by. I have been canning and preserving since I was a child; the tradition was passed down from my mother and grandmother. I think it is a food artform that is on the upswing. Keep up the great work. I love your site, I am and avid canner in the suburbs of Philly and feel your pain canning in an apt! 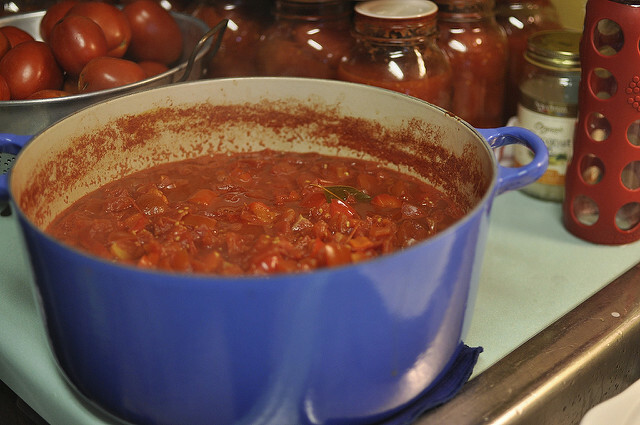 I made tomato paste last year and cooked it down on stove top, then roasted it in the oven to get it very thick. Mine was delicious. I’m so sorry your experience went so poorly! I have to disagree though, and say that I loooooove homemade tomato paste. I also think it’s really easy to do in the oven. I’ve been making tomato paste for years, for the sole reason that nothing I can buy tastes as good. I suspect it’s the tomatoes and the long, slow, cooking that make it so good. I use an heirloom paste tomato from the small organic farm I work at. The exact variety is unknown, we call it “Antique Paste” and grow it from saved seed each year. This tomato is similar to the Polish Paste variety but the flavor is a bit more complex and balanced. I chunk them up, cook for awhile (with nothing added), put through a food mill, and back on the stove to simmer for a looooooong time. I think the kicker is to cook it until it’s not only thick, but until the paste darkens a bit and starts to caramelize. It should be thick enough to drop 1/2 cup-fulls on a sheet of foil without any liquid run-off (I used to freeze it this way). I’ve just started canning so tomato paste was going to be one of my first projects, what are the chances the canning process itself changes the taste? Re-reading my post, I want to clarify that it’s not really caramelization I go for, it’s more building a layer of fond on the bottom of the pot and stirring it into the paste… over and over again. That process, combined with great paste tomatoes (I prefer horn shaped Amish or Polish type heirlooms over Roma’s), can give you a really special paste. Yesterday’s batch started with 6-7 quarts of chunked tomatoes and finished with 2 cups of paste going into the freezer. I haven’t decided yet whether it’s worth the extra work to can, or just stick with freezing…. but no question for me about making the paste. Thanks for this post. I’ve wondered about attempting it myself and now I know I won’t bother. I don’t use that much that I don’t think it would be worth my time. I’m glad you posted this. I’ve debated the merits of making my own, but I always get hung up on the initial amount of tomatoes vs. the end result. I would love to know where you find your tomatoes. I live relatively near you and have yet to find a good source. Thanks for sharing how many pounds of tomatoes you buy and what you get out of it. It really helps me. I pick huge sacks out of my garden, but I never know how many pounds = how many pints or quarts. It’s frustrating not knowing how many jars to clean. I’m getting better with my estimates each season though. Tomato paste is one of the few things I never had much desire to make, mostly because I always use a couple spoonfuls and the rest molds. Recently I found San Marzano tomato paste sold in a tube (like toothpaste). SO SMART! Bless you for even trying two projects at once on your stove. You’ve got more gumption than I do…..my stove can barely handle one quality project at a time if I decide to do a full recipe of anything…. …sad the paste didn’t turn out and your food mill broke. Two things I’ve been looking into. Guess I’ll scratch off the tomato paste and continue researching the food mill….need one for making applesauce. Next time you look into a foodmill, try a foley. We’ve had ours for about 27 years and it is a dream. I used a good-quality food mill for a couple of years, then recently invested in a Norpro Sauce Master Food Strainer (I use it for tomatoes and applesauce), also known as a Squeezo. Now, I want to sell or donate my food mill. The Food Strainer is SO much faster, less hassle once you’re familiar with setting it up, and it makes a great product. 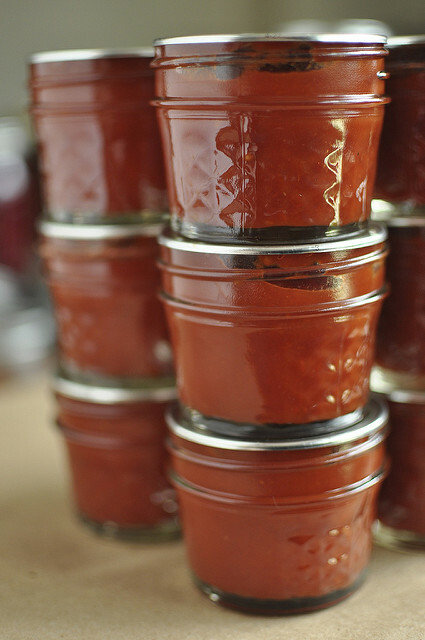 It processes a lot of product in a really short amount of time, which for canning, is awesome. A big thank you for sharing a project that was less than successful!! I’ve made a few things this summer that after all of the work and time invested were also disappointing. Glad to know I’m not the only one who experiences difficulties in trying to make delicious, nutritious and frugal foods for my family! I think I too will stick to Contadina! Thanks!! Your post has saved so many tomatoes and hours in the kitchen for the rest of us, thank you! A note on food mills: Last year I purchased the “Food Grinder” attachment for my KitchenAid stand mixer, and I cannot recommend it highly enough. It is the most genius, time-saving, incredible accessory ever, especially when processing huge volumes of food for canning. I’m really impressed at the 100 pounds of tomatoes in a tiny apartment! (Is your apartment tiny, I don’t know.) Sorry it didn’t turn out so well. My apartment is just under 1,100 square feet. So it’s not definitely not huge. I can hardly imagine leaving my oven lit for nearly 24 hours, in the summertime, yet! I think I would recommend doing it the way I make pumpkin and apple butters – Put it in a large slowcooker with the lid on sideways or even off altogether (once it gets up to temp), and letting it simmer for 18-24 hours till it’s thick and flavorful. Works amazingly well for pumpkin butter especially, with no worries about scorching it! I did Apple Butter in the crockpot this year and will continue to do it this way always. I used metal skewers across the top of my pot and then set the lid on them so my apples would cook down, worked like a charm. Always thought about doing tomato paste, now probably not. Thanks! Made tomato sauce this year after purchasing about 30 lbs of tomatoes from our local farmers market. I went late when they were about to go home and got a great deal cause most of them would rather sell it for less then to take them home. It probably didn’t save me that much money when you consider energy, time and materials…..but it sure felt great knowing that I made them myself! and I knew exactly what went in them!! As for the paste, I made my own a while ago and had a similar result. I made paste to save space as it was being frozen… I’ve found that adding a wee bit of sugar and a healthy bit of salt helps a lot. It’s still not that great as a pasta or pizza sauce, sadly. Thank you for the very honest testimonial. I appreciate it very much. Anyone canning us normally doing it to save money and the extra effort (a lot of effort) weighing with the cost savings is very important. At least you know what ingredients you are consuming. Thank you for the extra effort to record your work. Subscribing. I’m so with you about somethings canned are not worth it. My failed ones were tomato ketchup, which turned out to be sweet manwich sauce, and tomato soup. Tomato soup was awful. Poured it down the drain. Just seeing your stove brings a whole new level of respect for your craft. I great up with one very similar. Push buttons were on the back of the stove though. Always fun reaching over the boiling pot to turn down the burner. What a great post!!! Since I spent part of my summers, as a kid, sweltering in the sun and keeping any errant bugs off my grandmother’s “paste boards” in the back yard, I’ve never had the urge to make my own tomato paste. I’m not sure how she did this well into her 70s. This was while she also canned quarts upon quarts of tomatoes and tomato puree. I still love the smell of tomatoes being cooked/canned, though. I love your site and this blog in particular was great! My husband and I have always wondered about how tomato paste is made – its one of those things I marvel at. I really enjoyed all the comments and learning that comes with them as well – interesting that it may have been the ‘type’ of tomato that made it bland. I use tomato paste a lot and my husband tends to buy big boxes of it at Sam’s Club so I may hold off on this for awhile yet. Your kitchen is amazing – reading your blog for the past few months (just discovered it!) I assumed you lived in a gourmet kitchen. Thank you! I grew up doing 50 pounds of tomatoes in to paste every three years. It was divine. 1) Never give up on doing a failed recipe yourself. Try a new recipe, review your technique, and think about what may have gone wrong. 2) The first time you do a labor intensive project, do it small while doing other things. That way you can skip the heartache of failure and wasted ingredients. 3) Never don’t do something because an expert failed at doing it. Look at what they did wrong and fix their mistake. The following is the recipe I used. You will notice that it is simple. The only ingredient other than tomatoes is salt. Adding anything else is just asking for trouble and is unnecessary. Your goal here is tomato essence, not ketchup. Start early, before noon, as this takes a while. Peel, depip, squeeze tomatoes. Run through a food processor of any type to break it down. For every quart of tomatoes, add 1/4 tsp salt. Put in pot on stove and bring to a simmer. Reduce temp to a slow simmer and be prepared to reduce it more as it thickens. Stir frequently (in a good pan on slow heat, once every 20 minutes seems to work). If you want a more roasted flavor, put it in jelly roll pans in the oven at 200F and turn the paste every 30 minutes. Keep going until you reach your desired thickness. Run through a blender to paste it. Test pH, if it is below 4.6 hot water bath it. Otherwise freeze it, pressure can it, or add acid. The USDA water bath recommendation is from a cold paste. Your goal is to have the paste reach pasteurization temperature and times. Test your paste’s temperature when done and at least an hour before done. If temp is at a pasteurization temp, then just maintain temperature (you can blend it as much as 4 hours before done). You can then pour it straight in to preheated jars, water bath long enough to heat the headspace (10 min approx), put on heated lids and rings, an call it good – assuming pH under 4.0 (which is the norm with a paste). In the 4.0-4.6 range, I usually go at least 20 minutes to be safe. Any time you can, you need to remember what the advisories are based on (highly contaminated foods, unwashed, from room temperature). Too many people overprocess their canned goods and destroy the bright flavors and textures they would otherwise get. And for the love of peet, take off your rings and wash your jars when they have cooled and sealed. Only jars I have ever had go bad were either bad seals up front, dropped and the seals broke, or gift jars that were unwashed by someone else and molded through ring and seal from the outside. Finally, as a food blogger, you owe your audience a duty to try again, figure out what you did wrong, tell us how to make it right, and then evaluate if it is worth it to have bpa free tomato gold. I’m sorry to read that your tomato paste didn’t delight you, but you may find that it tastes better in January than it did in September! I made a dozen quarter-pints of tomato paste last year — using a different recipe than you, an <a href="all-tomato one from Eugenia Bone’s blog Well Preserved, and they tasted a bit bitter at the end of the cooking-down process. But after a little while settling in the wee jars, the paste mellowed some, and I found it both delicious and invaluable over the winter. Just opening the jar and smelling that good tomato aroma, in the middle of winter, made me feel hopeful! Maybe this is a case where the recipe really makes a difference? In any case, I hope you find your tomato paste useful, even if it’s not the star of your cupboard! To save lots of cooking time I put the peeled tomatoes through the food mill then put it all in the frige. over night. Most of the liquid omes to the top. I ladel that off then cook what’s left down. This takes about 1 hour, and I don’t have to be in the kitchen watching the pot all day. Okay, I tried my hand at ketchup last year, and I think if I ever try tomato paste, I will do what I did back then: I put my pureed tomato plus stuff into the shallowest dish I could find (I actually used two deep-dish pie plates), and into the dehydrator it went, because I was about sick of dealing with it by bedtime! The next morning, I was pleased as punch to find that it had reduced by half, and only needed a little longer. It did double-duty in that it freed up my stove for the canning of tomatoes (seems like I’m not the only one that had more tomatoes than could be killed off in one batch), and relieved me from having to constantly stir to prevent burning, etc. I highly recommend it. BTW, I almost decided to can my ketchup as paste–with a little blackstrap molasses, it really peps up the flavor, which I know is cheating, but hey, if it works! Check out the recipe from The Italian Dish, she recommends doing it in the oven. I did this last summer and it is by far better, richer and yummier than any I have ever bought. The post is Make your own Estratto. Or something like that! Do give it a try, if even for just one more batch, I could eat this plain right out of the jar. I wouldn’t take money to do that with canned! (Well, if it is enough money….)…. Salt should take care of the bitterness. Mark, no amount of salt could wipe out the bitterness of this tomato paste. Believe me. Did you add sugar? Most of us have grown up with processed tomato products. There is a lot of sugar in processed products. Some tomato sauces have up to 6 teaspoons of sugar per cup of sauce. I usually add 5 teaspoons of sugar per quart. I am going to try making paste this year, I use my Oster Juicer with the micro screen attachment to process my raw tomatoes. It removes the skin, seeds, and leaves me with a beautiful watery puree. I let it set overnight in the frige to seperate it and remove all excess water. I will cook it down on the stove but the when thick enough transfer it to the oven…much like making apple butter! I think the addition of both salt and sugar will eliminate the bitterness and I will add that to taste after it’s oven time. I’ll let you know the results as I am doing this, this weekend. What many people don’t realize is the quantity of salt needed when making paste. As you are concentrating the flavor you need to realize that the salt concentration must also be sufficiently higher. I would also recommend next time toss a half a Lemmon in the pot for the first half hour or hour of cooking. Do not squeeze the Lemmon. This will help develop flavor an if you are looking to not use as much salt as is needed in past this will give you that flavor you are looking for! A faster way to do your paste is to bake the tomatoes at 450 in the oven for thirty minutes or until the skins start to darken and caramelize and most of the moisture has evaporated then run through the food mill. This will peel and de seed. Then season well. If still to thin then reduce on the stove top. This will greatly shorten the cooking time! Thanks for the post. I have often thought that the amount of tomatoes and the time it took to make so little paste was a waste of time and tomatoes. In regard to the food mill, I bought an Oxo Good Grips food mill last year, and it was one of the best purchases I ever made. It is a bit pricey, around $50, but it is a work horse. I used it to make home made cranberry sauce last year. The cranberries only cost me $.50/pound and the sauce was very easy to make. The Oxo food mill is truly a work horse and worth every cent I paid. I will also use it for making jam from berries with tiny seeds that get stuck between your teeth. I have the OXO Good Grips food mill. It’s a great tool with ver sturdy legs that fold in and out for storage. I went to the NCHFP website for the tomato paste recipe and it’s gone! I’m getting “404 Not Found” errors. What’s going on? I know they re-did a number of recipe to account for the lower acidity in modern tomatoes, but does this mean they no longer approve of canning tomato paste?! That’s really weird. I’ve not heard that canning tomato paste isn’t okay anymore, but I’ve sent them an email, in the hopes that they’ll clarify. Just a thought…. Maybe it didn’t “turn out” because of the garlic/recipe…. Try a different recipe (or talk to other canning friends) to see if they have a favorite recipe. Even ask to taste some of their’s 🙂 I have a food mill that I love! It’s an older one that has its own stand with a wooden masher… Sorry I don’t know what type (I found it at our local thrift store) don’t give up on the tomato paste… I haven’t made any, but plan to this year. I made this and its wonderful! But, I tried to follow your links to the National Center for Home Food Preservation and I cannot find a recipe for this. Kinda makes me worry about its safety with no added acid. Can you give me any more info? I know sometimes they pull their recipes if there’s is the tiniest bit of doubt about safety. Thanks! next time make ketchup! I think it’s extremely worth it! I am looking for the recipe I made to share with you- it’s the best thing to do with a ton of tomatoes, next to canning them whole. I made the easy bake tomato paste from Put ‘Em Up by Sherri Brooks Vinton last year and was very pleased with the results. Her recipe uses ten pounds of tomatoes and yields about 4 cups. It has to be frozen, not canned, but since it doesn’t take up that much room and doesn’t involve as much hand-on time I found it to definitely be worth the time. What did you do with the bi-product (the skins, seeds, etc.) that you milled out? I am thinking of using the bi-product and running it through the food processor and using THAT for the paste? Hope it works! Great pictures and information. I discard the bi-product. I don’t think it would be good to use as tomato paste. The skin and seeds can turn quite bitter over time. Thanks so much for this wonderful and well written post about making T.Paste. I love your pics and your honesty. Keep up the good work! I’ve done two different batches of tomato paste just recently and they both turned out spectacular. Yes, it is time consuming but I must say that I will never buy store bought tomato again. I made mine a little different. I cooked down onions, garlic, and fresh bell peppers until they were soft. Then I added chopped tomatoes. After everything was heated through, I used an emerson blender to puree everything and I threw a couple of bay leaves in it. I dumped it in a large crockpot and turned it to high for about 6 hours. Then I dumped it in my large dutch over on medium heat and cooked it down for another couple of hours, bubbling the whole time. I like mine pretty thick so I stirred it really well for the last 30 minutes. Turned out great – smooth, slightly sweet, dark red Gold to me. Yumm!!! In light of the NCHFP recipe being unavailable.. (hopefully not for safety reasons..? ), I’ll be using this similar-sounding recipe from Bernardin — http://www.bernardin.ca/pages/recipe_page/51.php?pid=440 — Bernardin is a Canadian company, similar I think to Ball from what I have read on this Blog, and elsewhere. I probably cook with tomato paste more than any other tomato product (though diced tomatoes is a very close second) – so I’m really hoping the NCHFP recipe hasn’t disappeared for safety reasons! Canned tomatoes have the highest BPA…so your efforts and time is not in vein! It tasted flat because you didn’t add the red bell peppers, bay leaves and garlic. Absolutely essential for great homemade paste. Pickyourown.com has a great recipe and I have neve been disappointed with mine. I am canning some now, this is my third year! thank you so much for your honesty about the taste. I have loads of tomatoes and have decided to stick with roasting, or crushing for freezing. btw, roasting does save a lot of space in the freezer since they are dehydrated. Thanks for a great post. The first time I read it a few weeks ago, it scared me off. But then last week I tried 5 lbs of peeled & seeded tomatoes and reduced them on a jelly roll pan in the oven. I ended up with only 3/4 cup paste but it was AWESOME! I bought myself a food mill yesterday and picked another 20 lbs of tomatoes, determined to produce more paste. The food mill made my job a lot easier, and the tomatoes are in the oven but this time I’m using both the base and lid of my turkey roaster to reduce the sauce. I’m looking forward to having several half-pints of tomato paste! I just made tomato paste in the crock pot, I am cooling single bagging and adding to one big freezer bag keeping in the freezer till needed then using in soup and sauces. I Blanched, peeled and whirled them in my ninja food prep blender then into the crock pot on low till I filled the pot, I then added Onion Powder, Garlic Powder, Minced Garlic, Seasoning salt to taste, stirred and increased to high with the lid cracked to let moisture out, It took about 24 hours to get the paste I wanted. I will do this again next time. it was easy, I just had to stir it when I walked past. I love your pictures. Your sauce looks delicious. I have a bumper crop of tomatoes this year so I’m going to have to try this. We plant Juliet tomatoes, which are sort of like smallish romas – they are super meaty, and grow in grape like clusters. Last year we had so many we just roasted them skin and all, and blended them, again skins and all, in the vitamix. The skins just disappeared into the mix, and I think that between roasting and leaving those skins on, the resulting mix was already super thick. We loved it so much that this year, we planted an extra Juliet so we could make paste, sauce and pizza sauce – and no peeling. It looks like you initially left the skins on the tomatoes, and you also mention adding some cut up red pepper (sweet bell, I am guessing). Tomato skin will turn bitter, and I have found that peppers can be quite bitter with extended cooking. Salt and a bit of acid might help. I also think it is really difficult to predict outcomes when we are buying produce, no matter how good it is. Different varieties, different times of year, amounts of rainfall, or soil composition can have such an impact on flavor. 10 perfectly wonderful tomatoes may also be very different, and the the same variety you got last year, from the same farmer, might vary enough this year to be distinctly noticeable in a recipe with such concentration of flavor. Still, it’s always good to try and maybe try again! PS. We had that same stove when I was growing up, minus the powder blue finish. I think Nixon was president. I’ve been canning tomato paste for years as I have limited space for storage. 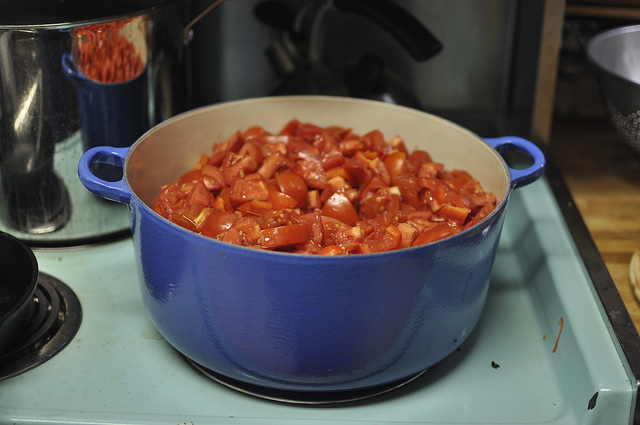 I love it because I can reduce 6 gallons of washed, chopped tomatoes to 8 half pint jars. I wash, chop and freeze the tomatoes as they ripen in gallon ziplocks. When I’m ready to process, I mill them with my Victorio Strainer. I cook them down to sauce consistency on stove top, then pour the sauce onto two cookie sheets and stick them in the oven at 325 for a couple of hours. You’ll have to pull the paste in from the edges of the cookie sheet from time to time to keep it from scorching, but much easier then constantly stirring on the stove top. To each hot, sterilized jar (20 min. at 225 in the oven to sterlilize then set to keep warm until ready) I add 1 teaspoon of lemon juice, 1/2 tblspon white Karo and 1/4 tsp. canning salt, then spoon the paste into the jars and process in waterbath canner. I’ve never had a jar go bad and its so concentrated that you can add water to it without diminishing the tomato flavor. You cannot taste the Karo or the lemon juice, its a blank tomato product that you can later add herbs etc to for each recipe. Could you use honey or simple syrup instead of karo? I’m new to this and just curious! I also heard you’re supposed to use really really ripe tomatoes? Can’t remember where I saw that but does that make a difference? The tomatoes should be ripe, but you don’t want them to be overly ripe. WOW – your version sounds much simpler. I am very tempted to try this one. I have made tomato paste also but froze it in ice cube trays. I blanched and peeled the tomatoes and used the peels for tomato powder after dehydrating them. Then run them through a spice grinder (coffee grinder). And we had that stove too with a brownish color and maybe Eisenhower was president?? Hi I think th store bought stuff has masses of sugar and salt in it..so we are used to the tom.paste being sweet. The seeds and skins can cause the pste to be bitter if the toms are cooked at all prior to removing. I found that freezing hte toms first then milling, a. you can pick the skins off easily whenthe thaw, and they go through the mill really easily. I freeze my toms in 3 kg lots till I hav eenough to use for sauce etc. I grow my own toms. I have been put off the paste myself because of the bitter taste, think it was over cooked, prob boiled it instead of slowly letting it reduce. hey I think the recipe for this is no longer on the National Center For Home Preserving .Just thought I would let you know . I know! I was looking too, I have always read that tomato paste was too thick to home can? I pressure can, but haven’t found a recipe that I was comfortable with. I hate taking up freezer space with paste, but its what we use most. The recipe in this post is an approved one from National Center for Home Food Preservation. I realize this is an old post, but I just came across it and am excited to see it. I’ve always wondered about canning my own tomato paste. I always can all of my tomatoes but end up having to buy tomato paste for spaghetti sauce and such. My tomatoes come from my back yard, so I won’t be losing as much cost-wise. It’s worth a shot! Thanks for the post. Dehydrate them and put them in a blender to powder them, and use that when you need paste. You can add as much as you need. I have also made tomato leather. After cooking the tomatoes down a bit I put them on a teflex? sheet that I have sprayed with an oil spray. The last step is important because you may be chipping those pieces off of the teflex sheet. Dry until they are dry throughout but still pliable. Wrap in plastic wrap and store in a jar or ziploc bag. Break off pieces as you need them. I have also made tomato powder to use. and thought I’d give it a try. I know from past experiences that the very acidic taste you get from tomatoes is from the gel that surrounds the seeds and this recipe has you remove this prior to cooking. I saw your site as well and felt bad that your attempts fell so short for you so I thought I’d share. Hope you give this a shot and feel your hard work pays off with this second try. Speaking of Masses of sugar…I tried making tomato jam 2 years ago. I’m not sure if you have tried this? I was a little skeptical when I was told about it but I guess it was once very popular! Well, it turned out really well and even if it is not something you would use alot of it makes a great gift because its bound to get a fair share of “Tomato Jam?” Are you suuuure’s…… Have Fun. Tomato “preserves” was very popular in rural communities back in the day…I have and still make the recipe passed down from my grandmother. Like Stacey, I used the recipe from Leite’s Culinaria procedure modified the steps a bit. I used about 10# of Oregon Spring tomatoes from my garden. Chopped them up in batches in a food processor then ran them through an OXO food mill with the medium disk. This gave me 7 qts of tomato mash that I reduced down to less than 2 qts of something close to a tomato puree. This took about 6 hours. Like Marisa, I started around 3 PM and it was now 11:30 PM. I turned off the heat and went to bed. In the morning I heated the puree, put some in my dehydrator and used the baking sheet method from the recipe. The dehydrator batch got to a paste consistence in about 1/3 the time of the baking sheet batch but the dehydrator batch was a smaller batch. I did not add anything to the tomatoes; not even salt. The taste of both batches was good. First time doing this and what I came away with is that it is a time consuming process to make paste. 10 pounds of tomatoes and a lot of work yielded four 1/2 pints. Four pints!!! I might go for the store bought stuff when this is gone, epoxy Bisphenol A and all. Why don’t the tomato processors switch to glass? I use the recipe from TheItaliandishblog.com. Though I haven’t tried canning it, follow her steps, it is amazing!! I think it could be canned minus the olive oil on the top, and adding a tsp. of lemon juice to half pint jars, (directions on the website pickyourown.org) I could just spread this on toast!! Hi, I came across your lovely blog trying to figure out if I can add a can of tomato paste to my homemade tomato puree before I can it. Since everyone here is talking about making tomato paste and canning it, I think I am OK as long as I add the lemon juice. BTW, the relatively fast and easy method I use is: wash the tomatos and put them through my ancient hand-cranked “Squeezo”, which is like a Roma. Put it all in the BIG pot and get it boiling. Then put as much as I can fit in the crock-pot, on High (I think it’s 7 quarts.) leave the lid half off. and let it cook down. If I leave it a couple of hours it cooks down enough to add more from the big pot. By the next morning it is thick! I freeze these batches til I have enough to can. I couldn’t live without my “Squeezo”. We bought it over 40 years ago and it’s still going strong. We use it for tomato sauce, (DH makes great speg.sauce) apples, pears, pumpkin and winter squashes (cook and slightly cool first). I use my crock-pot too,(we have 5) for cooking down sauces and making applebutter. We can for ourselves and children’s families, a total of 11 mouths. (they help) In our best year, about 1000 jars inc soup, sauces, jams etc. Processing home grown will help us maintain a budget when I finally get to retire too. I’m a canning novice but I like to play & learn. This year I had a lot of volunteer Roma tomatoes to deal with. I dehydrated some but new ones kept coming. So I ran a pan-full of tomatoes through my juicer, then put the juice in a sauce pan and slowly cooked it down. It looked so good that I never got around to trying to can; I went ahead and made it into marinara sauce and had many good meals. I’m now wondering, after reading all the informative comments, if what I did might be a good start to making and canning paste? My marina wasn’t bitter at all. And the juicing took seconds and was so easy. So, I thought I’d just share my story in case its of interest and helps, and I welcome any thoughts anyone cares to offer in return. Regards. I’ve made paste, and it is time consuming ….. I’ve found that if I throw the simmered chopped tomatoes, peels, seeds and all, in one of those old-fashioned sieves, the “juice” that first runs off is almost clear. I cook & reduce this watery stuff down, (and this you don’t have to watch quite so closely) then press out the rest of the tomatoes through the sieve with the wooden pestle and add this to the reduced liquid. This seems to reduce the cooking time. Once the puree has been added to the reduced clear juice, you have to almost be stirring constantly — otherwise the bottom will burn. I perch on a stool with a good book, stirring all the while. I have been experimenting with using a dehydrator to evaporate my tomatoes. I stir them about every 8 hours. But it seems like a very good way to get the water off and not lose so much of the nutrients or my energy. I will admit to cooking them into a thick sauce consistency before putting them into flat cake pans in the dehydrator. as they cooked more and as my sauce cooked more I added more sauce to the pans. I ended up with a nice red thick paste. A crock pot with the lid propped open works amazingly well for cooking down tomatoes. Once my initial cooking was done and I removed the skins and seeds I put my sauce in the crock pot on high and prop the lid open with a wooden spoon. Let this cook overnight and I had an amazing sauce to can without having to keep watch over it. If you let it go longer I’m sure you could get paste consistency. I have done all sorts of things with tomatoes as I always have an abundance. My 6 children loved having “Salsa” cookoffs inviting their friends to come be the judges with bowls of chips. We now have a family favorite salsa recipe, adding a new one with zucchini in it, and a favorite Tomato sauce, that we use for lasagna, enchiladas, chicken parmigiana, pizza, chili, and other things, that has green peppers, onions, garlic, Italian seasoning, black pepper and salt to taste. I cook it down and take off quarts of juice that we drink or I use for chili or other soup. Put tomatoes through food processor. If skins aren’t too blemished, they don’t need to be peeled. Cook for 30 minutes and take off about 3 quarts juice. Add 1 can tomato paste to make it smooth, or take off an extra cup of juice, adding 2 T. cornstarch to it, mixing well and put back in sauce. Cook and stir until sauce is thick. I have done both thickening methods and they are the same, but I lean to the paste. Pour into bottles and seal with new sterilized lids. Process in pressure cooked 15 minutes at 10 lbs (depending on your elevation) Makes about 18 pints of sauce and 3 quarts of delicious juice. 3-4 green Anaheim chili’s without seeds, chopped fine. If you like it hotter, put the hot peppers in the blender after you seed them, if you want more heat, use the seeds. 4 green jalapeno chilis without seeds, 1 with seeds. I have used zucchini to give it more texture, and also yellow pear tomatoes, as we like the color and chunkiness. Cook mixture for 2 hours. Can take off 1-2 quarts of juice for thicker salsa, which is delicious in chili. Put into jars and seal. Water bath for 5 minutes Makes 12 pints. Hope you try these…they have been our favorite for over 25 years. Our son-in-law from Guatemala adjusts the heat. Tomatillos can be used, and if so, cut down the vinegar. After cooking I line a colander with cheese cloth and drain a lot of the water off.cuts the cooking time a lot. Do I HAVE to put my jars of spaghetti sauce , pizza sauce , etc into a hot water bath to can them or can I just put the piping hot sauces into jars to seal themselves ? You need to do the boiling water bath canning process. It is not safe to skip the processing step. This is the first year I’ve canned tomato paste. I love the fact that fewer jars are used, as well as less pantry space to store it. 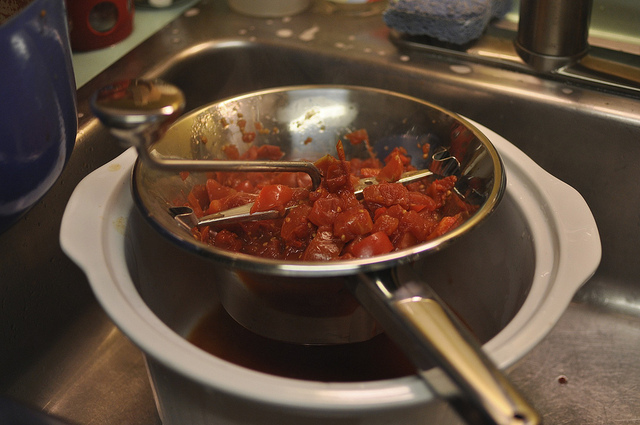 After putting the tomatoes through my ancient Victorio strainer, I use the oven to condense the sauce down to paste. I use a pyrex 9 x 12 baking dish, with the oven set to about 300 degrees while I am awake and able to stir every once in awhile. During the night, I leave the oven set to just above the “keep warm” stage on my oven controls. This method takes a long time, usually about 24 hours per batch, but I don’t mind. I don’t have to stand at a hot stove and the paste takes a minimum amount of time stirring. OK. I did it. Mostly because I’m on a low histamine diet right now and can’t eat the ridiculously small amount of tomatoes that have survived both early and late blight this year in my garden. So, I bought 4 more pounds of roma tomatoes to add to my 1 pound, to make half the recipe. I’m certainly glad I didn’t buy more! I wasn’t able to taste mine, and it would be pointless to even put what I got into a 1/4 pint jar. I have it in the freezer now, spread out on a parchment lined baking sheet and, when frozen, I will just divide it in layers between parchment and freeze it. Truly, I could have purchased a LOT of canned tomato paste (which I really don’t even use very much, anyway) for the $10 I paid for organic, locally grown tomatoes. But… I have questions… Can one just “fire” roast the tomatoes in the broiler to remove the skins, like when roasting peppers to do the same? Just drizzing the oil over the tomatoes before roasting? Or what about just blitzing everything except the cores in a high powered blender? My experience was that the tomato skins really got in the way of removing the seeds with the food mill. I think I could remove the tomato skins in about 15 minutes vs. the 1-1/2 hr. it took to process them in the food mill. Look into buying a Victorio Strainer. I use it for tomatoes to make tomato juice, sauce, and seedless salsa. It also has a berry sieve, so can make blackberry jam with all the pulp, but no seeds. Also, you can just steam apples till soft, with no peeling or coring, put through and get perfect applesauce. I have been canning for over 40 years. I couldn’t do as much as I do without this piece of equipment!